I mentioned I made treats yesterday. Today we plated those treats and dropped them off to some big friends. They were well received. 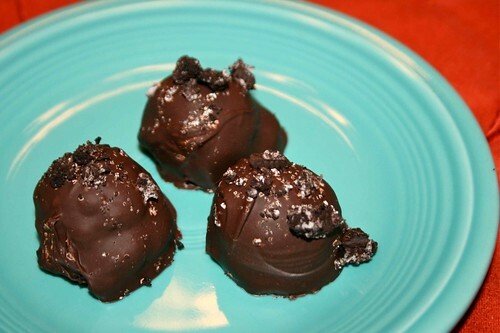 One of the treats I made is Oreo Truffles. I'd made them before but didn't like the Bakers Chocolate. This time I made them with Nestle semi-sweet chips instead. I still haven't eaten one but everyone that's had one has loved them. I took some of the treats to share with my Sunday School class. They were a big hit. Did I mention I teach the teenage class?